First of all a big thankyou for featuring my bird population as the banner photo and to Mitch for hosting this week. As Mitch said, something different with interiors. I do not get out so much now and my pictures of the great outdoors are mainly from the car. I will be getting my electric wheelchair before Christmas, and when the weather improves I will again be able to get out with the camera. Holding a camera in one hand and a walking stick in the other does not work so well and a zimmer frame is the last thing I want. Anyhow now to my pictures. As Mitch showed us his computer central, I will show you mine. Not so spectacular as I am a sort of portable person. 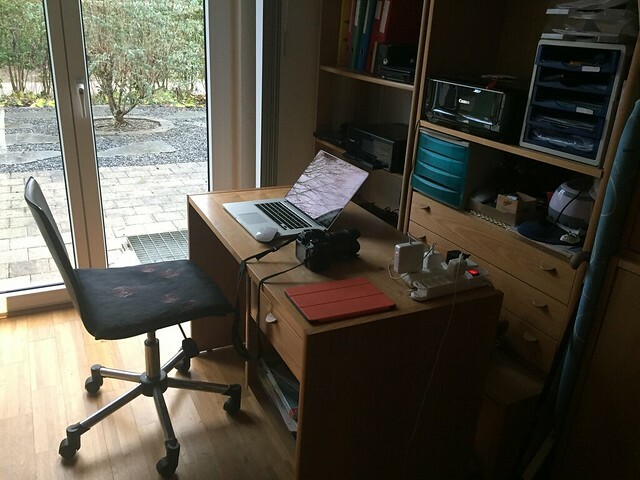 I have an Apple computer, on the photo, which has a battery life of 10 hours, so do not need to attach it with a cable and also an Acer computer, also a laptop, but ideal for working in different rooms according to where I am. In the morning I am in the kitchen and in the evening in my "office" shown in the photo. I have a place for everything and when I am finished with the computer, the desk is empty. I then have my iPad for sitting in the living room, which you can see on the desk with the orange cover. This is a typical restaurant in a village near to us. 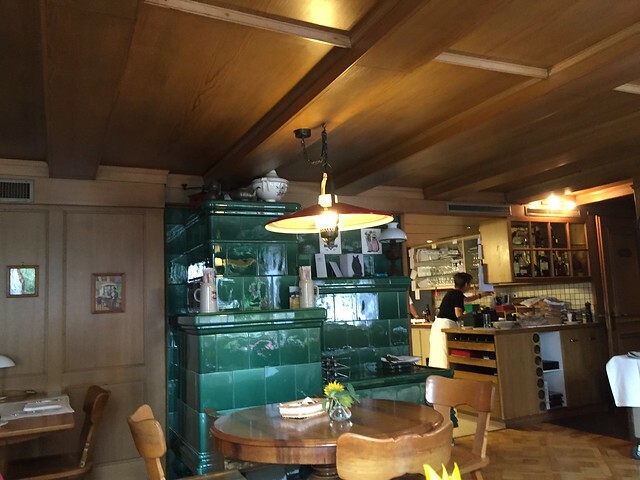 They still have the old stove in the restaurant with the green ceramic tiles which was the center of comfort in the old Swiss houses. They were a nice warm place to sit in the old days. I took this one on the escalator in the local supermarket. And this is Waltham Abbey near London. My friend's boyfriend lives in Waltham and I was on a visit. Great shots, Pat. So glad you feed the birds; I think they would be flattered to see themselves in the banner shot. Very nice computer station with your camera there too. Wonderful shot of the restaurant and gorgeous green tiled stove. I love the lines in the escalator picture and the high spaces in Waltham Abbey. Hi Pat!! Wonderful shots for the theme. Thanks for a look at your 'computer central'. It looks like you are as tidy as me and don't like lots of clutter!! Lovely little restaurant. Is the cuisine as traditional as the tiles? 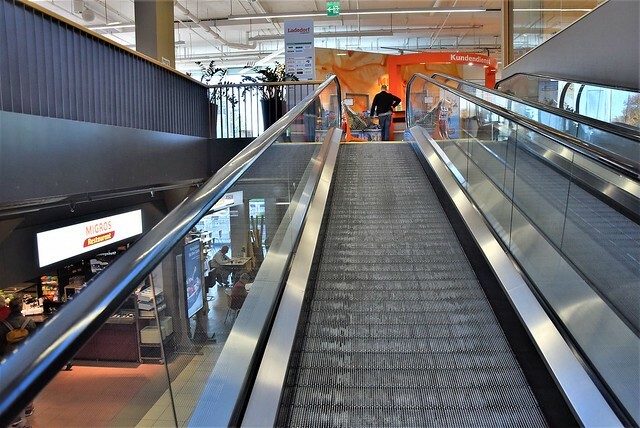 I like those escalators......better than the ones with the really big steps we have here in the Uk.....yours are more like the 'moving walkways' you see in many airports, only sloping instead of flat!! 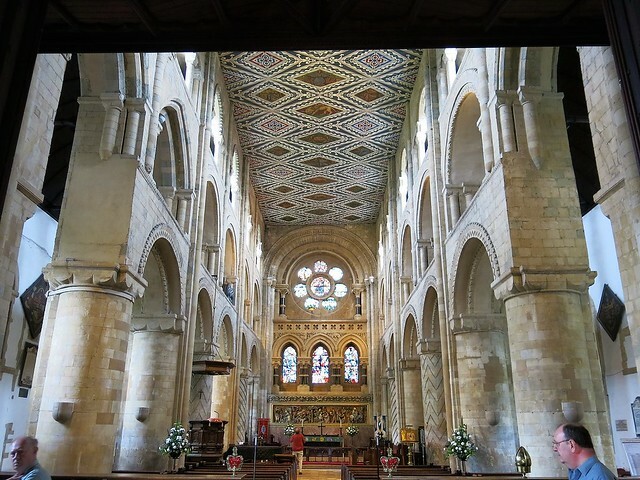 Wonderful view of inside Waltham Abbey. Hi Pat! Nice shots for this week's theme. You made a good choice of shots... good variety of interiors!